Back in the 1990’s when print on demand was just taking off, some of the first killer applications to develop were product support documents including instruction manuals, user guides, and registration cards. Short run quantities, lots of variation, frequent updates, and the synergies with “just in time” manufacturing made them a perfect fit for digital printing. Eventually, the Internet killed the opportunity. Now, very little print is included with products. Today, manufacturers simply refer customers to a website where they can watch an instructional video, read the manual, and register online. Just another example of print’s obsolescence in favor of digital technology. If you’re looking for a way back into the manufacturing and product support departments, one way might be to offer 3D printing. Of course you’re probably thinking that there is no way 3D printing can be competitive with traditional methods of manufacturing products, right? While that may be true (for the near-term anyway) 3D printing can and is being used to produce replacement parts. Need an example? Check out this article from Wired Magazine about Teenage Engineering, a manufacturer of music synthesizers. The company is making the 3D files of its parts available on Shapeways, a web-to-print 3D printing service. 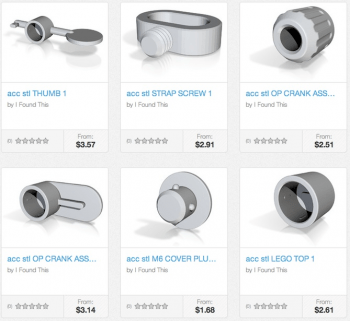 Customers can download the files for free and print them on home devices, or order them, on demand through Shapeways. Formlabs posted this project to Kickstarter yesterday with the hopes of of securing $100K in funding. In less than two days it has already received over $800,000 from more than 550 backers. With 28 days to go, this project may set a record. Their device, the Form 1 Professional 3D printer ups the quality of desktop 3D printing significantly, with a resolution similar to professional systems costing $30,000 to upwards of $1 million. It took years for digital printing to reach a quality comparable to offset, in large part because few companies were innovating in that space. Crowdfunding changes the game significantly, allowing multiple small companies to innovate and bring their products to market with unmatched speed. With quality improving so rapidly, one has to wonder how long it will be before they reach production speed. What took companies like Xerox, HP and Canon years to accomplish, is happening now, in this space, in mere months. For more information check out this post from TechCrunch. Do you work with a brand that has a well known mascot? Here is a great application for 3D printing. Cubify.com is working with Google’s Android team to produce personalized Android figurines. The site allows you to fully customize your Android with 3D accessories and 2D stamps, then order a 3D printed version of your creation. Can you imagine how many passionate brand advocates would purchase one of these for their desk or office? Since this site works on behalf of the printing industry we should also note that Cubify.com is a consumer-oriented, web-to-print site that has already produced THOUSANDS of 3D products, on demand. Sound familiar? If you’d like more information on 3D printing and how traditional printing companies can incorporate it as a capability, CONTACT US today. Within a week two different manufacturers of 3D printers announced they will open retail locations where customers can see their products in action. First, MakerBot announced it would open its first retail location in New York City in conjunction with the launch of its newest product – the MakerBot Replicator 2 Desktop 3D printer. 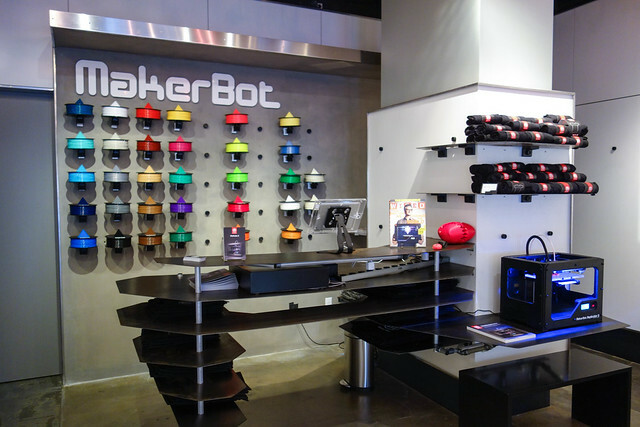 Then Deezmaker, another maker of desktop 3D printers announced it would open its first retail location in Pasadena, California. While both manufacturers have cited retail stores as a great way to demo (and sell) their products, its almost a given that they will also sell products manufactured on their devices. So, it’s likely that the first 3D print shops have just opened for business. What could this mean for the 2D printing industry? For traditional printers this could be a huge opportunity to expand into a new and growing market. While the mechanics of 3D printing are certainly different than digital printing, the process is essentially the same. A file comes in and a product goes out. Who better to manage that workflow than a printing company? There will be a learning curve, but as the technology improves and processes are reduced to practice, 3D printing could provide traditional printers with access to a whole new market, injecting life into an industry that’s seen its share of decay over the last few years. We think that’s an opportunity worth pursuing. Why should those of us in the printing industry be interested in 3D printing (or replicating, manufacturing, etc?) First, the process for printing in 3D almost the same as 2D. File comes in, file gets submitted to the machine, product is manufactured, product is finished, product is fulfilled. Granted, its a different kind of input (CAD vs. page layout), different kind of machine, and different finishing processes…but the same was true for digital vs. offset printing. Regarding the markets and applications, right now the main opportunities are probably in Engineering and Product Support, which was also the case for 2D large format digital until the quality was good enough for use in marketing and other applications. Early 2D digital innovators sold digital blueprints, but also ran a lot of spec books and product support documentation for their clients. Their clients were also among the first users of digital color – willing to pay over $1 per page in the early 1990’s. Further, you might ask how developing a relationship with Engineering / Product Support could advance your overall revenue and presence in an account? Do they have other “traditional” applications that you could support (How-to Guides, Installation Instructions, etc.) Could 3D printing help you get them? Worst case, you’ll separate yourself from competition. Also, Engineering typically woks pretty closely with marketing and other departments to make sure products are launched on time. Could this help you cross-sell? I’d also add that 3D printing is expected to be a $5.2 billion industry by 2020. People are already building 3D web-to-print (or whatever verb you’d like to insert here) portals. They’re marketing them to B2B and B2C clients. Some have already produced thousands of projects for their online customers. At some point, people may use 3D printing like a fax service, scanning an object in one place, and printing it in another. Who better to manage distributed “printing” than printers who already have the networks, space, location, talent, etc? While 3D printing is very young, its definitely disruptive technology. You can either adapt or resist, but I don’t think you can ignore it. Digital technology has gutted print in too many places (newspapers, magazines, books, catalogs, direct mail, etc.) already.